These were the words of “Senhor Salvador,” a long time Christian and former employee of the Quéssua Mission before the war. When the first team to arrive in East Angola this year visited the village of “Mangas,” Salvador was there to worship with us. He had worked alongside missionaries from the US and Canada for many, many years. When those missionaries were forced to leave Angola during the years of the independence war, Salvador, like many others, suffered greatly. With his 94 years of age, he had tears in his eyes as he thanked God that missionaries are returning to Angola. In the months of January and February the first two times arrived. Comprised of 5 persons, including Rev. 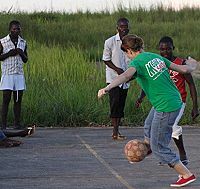 Beth Fogle-Miller, conference director of the Council on Ministries, the first team visited Jan. 13 - 19. 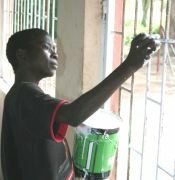 They painted and renovated the boys’ Boarding House in Quéssua, and delivered over 200 pairs of reading glasses to neighbors of Quéssua and Malange. Sandy Goodman, one of the team members, donated over 40 mosquito nets. More importantly, our ties of friendship became stronger. Angolans see that they are loved and accompanied. One highlight of the trip consisted of a meal that the missionary team served for the boys of the Boarding House. We had time to eat together, read letters sent by children in Florida, laugh, and share stories. However, the boys would say that a highlight for them was receiving soccer balls the team brought! expenses for redoing the electric lines of the Boarding House, and hired another person to install bars on the windows. They bought new bunk-beds, mattresses and more mosquito nets for the girls’ and boys’ dormitories (this latter in Quéssua). On Saturday, Feb. 13, they conducted a VBS for the children of Malange Central. They gave a generous offering to this church, which includes money to purchase a motorcycle for the local pastor. Their last day in Malange was a blast, because they took the girls to the Falls of Kalandula, near Malange. (See pictures of the falls at: www.pbase.com/arodri3). The girls jumped into the waters of the river and took a refreshing and fun bath. The Bishop of East Angola, Bishop Jose Quipungo, treated both teams to a delicious meal at a local hotel on their last night here. The Bishop thanked them for their work and listened to their impressions about the United Methodist Church in the East Angola Conference. Both our teams appreciated the Bishop’s hospitality. It is very meaningful for Angolans to have our teams visiting. Beyond the material aid, Angolans see that they are not alone in their hard work. Our teams also experience God in a palpable way: the faith and devotion for God that Angolans express in their worship services are very contagious. Our teams are bringing back to Florida the resilience and joy of Angolan United Methodists. Alcides Martins in 2005, for helping us with the paperwork for the visas in Luanda. Many thanks also go to the staff at the Conference building in Lakeland, Florida, for facilitating the trips. And to the 13 Floridians who have already come in the two teams: “you rock!” Many thanks for sharing the best of you with the church in East Angola!